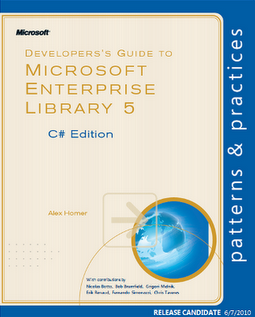 The Microsoft Enterprise Library is a collection of reusable software components (application blocks) designed to assist software developers with common enterprise development cross-cutting concerns (such as logging, validation, data access, exception handling, and many others). This book is designed to help developers on teams that have chosen to adopt Enterprise Library get up to speed quickly. If you build applications that run on the Microsoft .NET Framework, whether they are enterprise level business applications or even relatively modest Windows Forms, Windows Presentation Foundation (WPF), Windows Communication Foundation (WCF), or ASP.NET applications, you can benefit from Enterprise Library. This guide helps you to quickly grasp what Enterprise Library can do for you, presents examples that show it in action, and make it easier for you to start experimenting with Enterprise Library. The book walks you through functional blocks of the Enterprise Library, which include data access, caching, cryptography, exception handling, logging, security, and validation. It contains a large collection of exercises, tricks and tips.